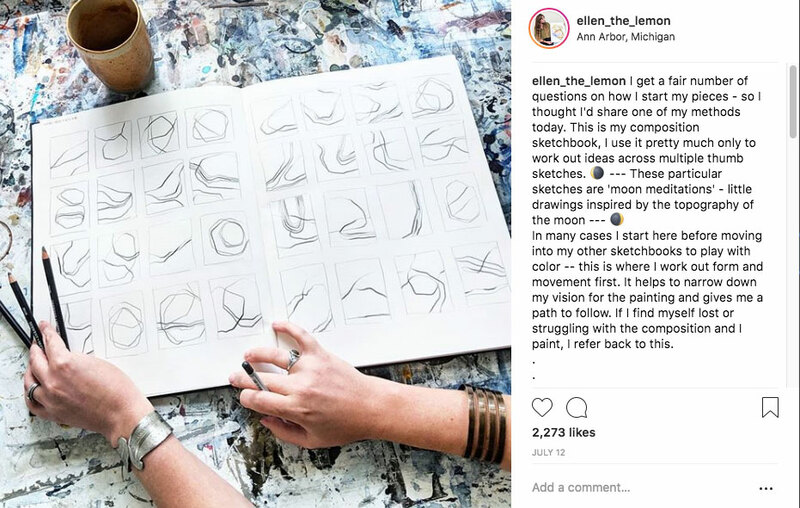 The other day I posted a look into my composition sketchbook on instagram and received a flurry of questions on the process, materials and ideas behind keeping this collection. Rather than write out paragraphs to respond there, I thought I’d take some time to provide a more detailed look into these studies. This book cover has seen a lot of paint/chalk/pencil. I’m a big fan of keeping multiple sketchbooks at one time - each with a very clear and defined purpose. Color tests, travel sketches, morning sketches, still life contours, and a composition book. Keeping things separated like this allows me to reference sketches and images faster and it just appeals to the side of my personality that likes to have a space for everything, and everything in it's space. 1.) Collecting sketches from other books/cut paintings with particular compositions that I feel could use more exploration and gluing them in. 2.) Creating purely compositional study sketches on the pages. By adhering to these two tenants I end up with a book of painting ideas divorced from color (mostly) and subject - but focused on rhythm, movement and motion. I use these pages to explore ideas for paintings in a pre-sketch phase. If I’ve got an idea that I want to work with, but it lacks form I open up this book and search through the studies until something clicks. If nothing does, I make however many more studies are necessary. Looking back on years of composition studies has been pretty enlightening as to the evolution of my process. The forms I work with are so dependent on location and my surroundings that’s it’s pretty easy to pinpoint when I moved from Miami, when I spent time in Ireland, Thailand and Japan, when we were snowed in last year and couldn’t leave for 4 days… at this point it functions almost as a journal with no words.